A combination of muscle weakness and strain results in a hernia. It happens when fatty tissue squeezes through a weak spot in the surrounding muscles. A hernia is a protrusion of an organ or tissue through a weak area in the wall (muscles or tissue) of the cavity that contains it. The commonest hernia is an inguinal or groin hernia. When there is a weak area in the muscles of the lower abdomen it results in the protrusion of fat, intestines or other tissue through this defect. This bulge may on examination be: Reducible: the fat or tissue can be pushed back into the abdominal cavity and the hernia will flatten and disappear. Non-reducible: the fat or tissue cannot be pushed back and the hernia will not flatten. This is a situation usually requiring early medical attention. A lump or bulge that appears when the patient stands or coughs and returns to its normal position with gentle pressure or by lying down. In abdominal hernias there is a dull ache at the site of hernia.In hiatus hernia, acid from the stomach may enter the oesophagus and the patient may feel a burning sensation in the middle of the chest. Acid in the oesophagus can cause oesophageal ulcers. What are the riskfactors of Hernia? A hernia can develop at any age. The following factors can increase an individual’s risk for developing a hernia: Lifting heavy weights. Chronic cough. Obesity. Straining during bowel movements or while urinating. Pregnancy. Persistent sneezing caused by allergies. Poor muscle tone. All the first six cause rise of pressure in the abdominal cavity. 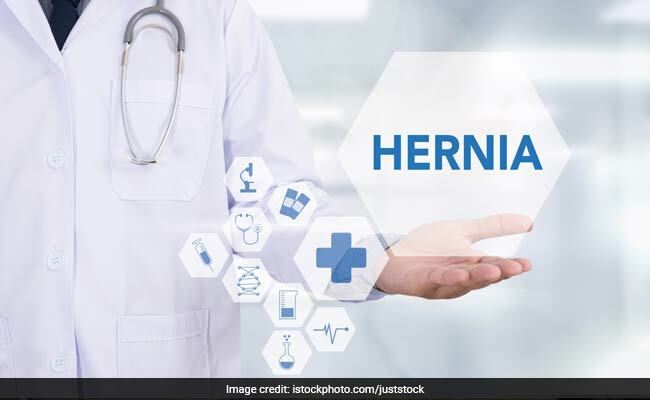 Depending upon the body part involved the most common types of hernias are: Inguinal hernia - Inguinal or groin hernias are more common in males. Normally a tough layer of tissue called the fascia transversalis, surrounds the abdominal cavity. There is a small natural hole in this layer called the internal inguinal ring. If this hole enlarges, the intestines may bulge through the internal inguinal ring. The protruded intestines lie under the skin in a sort of bag, the hernias sac and contents are externally visible as a lump in the groin. Hiatus hernia - A muscular diaphragm separates structures in the chest from those in the abdomen. The oesophagus, or food pipe, passes through an opening (hiatus) in the diaphragm to enter the abdomen and join the stomach. The stomach is mobile in the abdominal cavity and sometimes slides through the oesophageal hiatus to partly enter the chest. This condition is called a hiatus hernia. Umbilical hernia - This occurs when protrusion of intestine (or other organs) result because the firm tissue in the navel becomes very thin resulting in a gap. Incisional hernia - This can occur at the site of a scar from previous surgery. The fat or tissue pushes through a weakness created by the surgical scar. This can occur soon after or months or years after the initial surgery. Femoral hernia – This presents as a swelling in the upper part of the thigh just below the groin crease. It is not a common hernia. In most cases physical examination can easily detect a hernia.Laboratory tests and X-rays may be asked for if an operation is planned. What is the treatment of Hernia? A supportive truss or belt is used only for those who are unfit for an operation. This is an elastic band that exerts pressure on the defect in the abdomen. Wearing a supportive truss can help stop a hernia from protruding but cannot cure it. Surgery is the only definitive cure for a hernia. The operation may be done under general, spinal or local anaesthesia. Various operations can be done for hernia repair. The repair may either use the surrounding muscles and structures to strengthen the defect in the abdominal wall or a nylon mesh may be used for the repair. The operation is quite safe and takes about an hour.More recently, the hernia repair is being done by laparoscopy. This is a surgical procedure for hernia repair in which a viewing tube and special instruments are used to repair the hernia from within the abdomen through a small opening. Lifting, pushing, or pulling heavy objects should be avoided. Smoking should be stopped to prevent a smoker’s cough. Eating a high-fibre diet that includes grains, cereals, raw fruits and vegetables and drinking lots of water help relieve constipation. If allergies are a problem, medication to treat sneezing may help. Sometimes the hernia cannot be pushed back into the abdominal wall by pressure and the bulge may contain intestine that can be trapped, losing its blood supply, a condition called strangulation of the intestine. When this occurs the patient experiences severe pain and vomiting. If surgery is delayed it can lead to gangrene or death of the intestine thus emergency surgery is required.